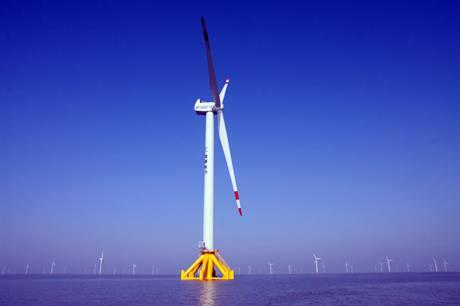 CHINA: China Shipbuilding Industry Corporation HZ Windpower (CSIC-HZ) has launched a new 5MW offshore wind turbine and awarded Danish firm LM Wind Power the blade supply deal. CSIC-HZ's first H151-5MW offshore platform rolled off the production line in October, according to the manufacturer. LM Wind Power has agreed a strategic collaboration with the manufacturer to supply the blades for the turbine. LM will manufacture the blades at its Jiangyin facility, east China. The deal was signed at the China Windpower 2016 conference in Beijing last month, where the turbine also received its type certificate. The first set of turbines will be installed at a wind project off the Chinese coast by the end of 2016, LM said. "It is a great pleasure to support CSIC HZ Windpower, a pioneer and leading player in the development of the offshore wind market in China, and launch their new offshore wind turbine platform," said LM chief executive Marc de Jong. "This deal strengthens LM Wind Power's growth in China and emphasises the importance of highly reliable and efficient blades as a key factor for expanding the growing offshore sector," de Jong added. China is targeting 5GW of offshore wind in its 13th Five Year Plan (2016-2020). LM is in the process of being acquired by US conglomerate GE Renewable Energy, after a deal was agreed in early October.